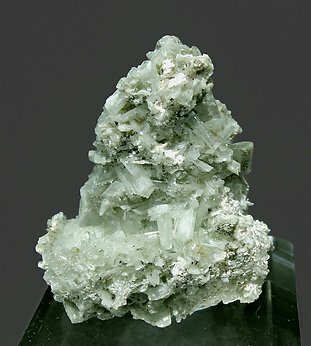 Very sharp Paravauxite crystals on a rock matrix. The crystals are pearly white, translucent and very bright. The sample is from the type locality for the species. We’ll send to the buyer the original label and also a copy of the computer card with the full text in the collection catalog. Very sharp, well defined and bright prismatic crystals on matrix. Registered with the Folch collection number 3754, it was previously from the A. Santos collection (1952). 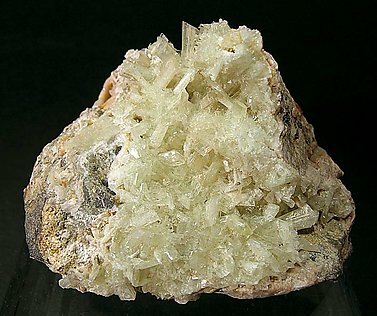 Only one mine produces good Paravauxite and none have been found there for years. So when I get hold of one from a collection or Museum I am very pleased (this one comes from the Seaman Museum). Lots of crystals that, while small, have a ‘fresher’ look than is typical with this species. We will send you the original label from the museum. 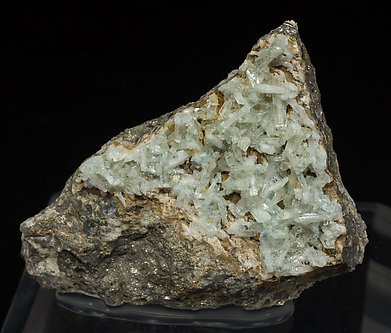 An excellent sample with thick prismatic crystals of Paravauxite, on matrix, with very well defined faces and edges, of a slightly greenish yellow color and very bright for the species. 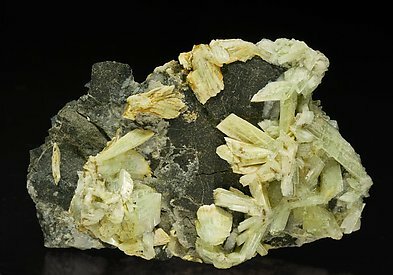 In some areas on the sample and near to the Paravauxite crystals are growths of thin prismatic crystals of the rare mineral Sigloite, smaller and orange in color.